The Battle of Vimy Ridge, part of the northern operations of the Battle of Arras, which took place 95 years ago today, was one of the defining moments for Canada in the Great War. Up against formidable objective, all four Canadian Divisions – men from every part of Canada – took the ridge in five days at the cost of just over 10,000 Canadian casualties. Together with success in the British sectors at Arras, the sort of advance experienced on 9th April 1917 had hitherto only rarely been experienced and reflected the change in approach to battle not only in the Canadian Corps but in the British Army on the Western Front as a whole. For a post-war Canada coming to terms with the lost of more than 66,000 Canadian soldiers in the Great War the fighting at Vimy took on a symbolism hard for others to understand; many felt that it was almost as if Canada as a Nation had come together on the slopes of Vimy Ridge. The French government gave the battlefield to Canada who turned it into a memorial park which today is one of the most visited sites on the Western Front battlefields, and one of the largest areas of preserved WW1 battlefield. Today’s photograph is an official photograph but taken from a special album of photographs published during the war as part of an exhibition of Canadian war photographs. The photographs were printed in landscape format in quite large scale direct from glass negatives, so the quality is very high. 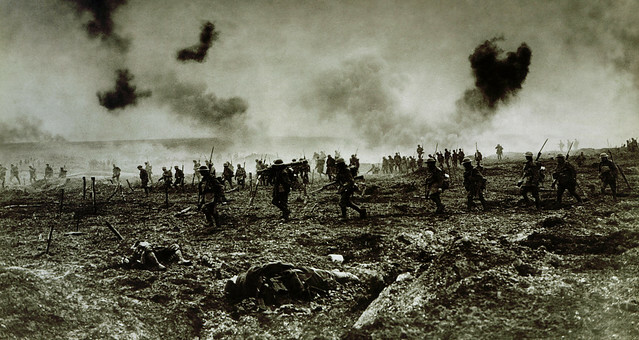 This dramatic image shows Canadian troops going into action 95 years ago today on 9th April 1917 – they are men from the 29th Battalion Canadian Infantry who were operating on the southern end of the Vimy front. This entry was posted on 09/04/2012 by sommecourt. It was filed under Arras, British Army, CEF, France, Great War, Hindenburg Line, Western Front, WW1 and was tagged with 1917, Arras, Arras95, CEF, Vimy, WW1. Would like to know more about the special album of high quality photographs. Canada is just waking up to its history which was stifled and whitewashed during the 60’s and 70’s.